5a: Short jab with Angra Mainyu. 5b: Sakura extends her tentacles. Hits mid. 2a: Sakura sits and stabs with her tentacles. 2b: Sakura sits and extends her tentacles low. Pulls opponent. 2c: Sakura gets on her hands and knees and sprouts dark spikes. Jump cancelable. Launcher. 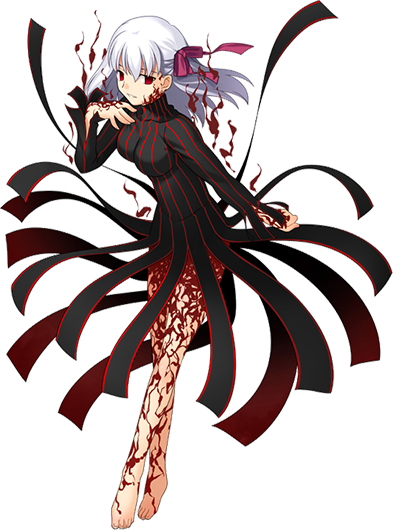 j.c: Sakura extends her tentacles for a long reach diagonal stab. 6c: Sakura bends over and stabs forward with a forked spear of tentacles. 236a/b/c: Sakura shoots out a wave of darkness on the ground. a version = 1 hit projectile. b version = 3 hit projecile. c version = Cloud that hits low. Launcher. Negative-Edge. 421a/b/c: Sakura uses her tentacles to attack. a version = Rising spear. Jump cancelable. Launcher. c version = Sakura sweeps with her tentacles. Hits low. 236236a: Wrapping super - Sakura grabs the opponent and pulls them into the darkness. 2000 dmg. Throw. 236236b: Baloon Super - Sakura makes a large baloon out of Angra Mainyu and it explodes. Up to 2700 dmg.